Oh it’s prerelease weekend already? We’re all looking forward to Dominiaria, 25th Masters is coming soon, and I just finished up a great weekend at GP Santa Clara. Hopefully you’re opening cards and trading them away immediately. It’s always a safe bet, and advice I give every time. Some cards are really picking up in price as we go forward and people pre-order for brewing, but with a Banned and Restricted announcement Monday (they’ve promised no Modern changes) lots of people are hesitating on brewing for Standard. The exact numbers are fluctuating pretty wildly, given that this is weekend #1, but it’s worth noting that even at prerelease prices, only about a third of rares or mythics will get you your $4 back. If your store offers credit in lieu of prize packs, take it. Let’s look at some prices, shall we? 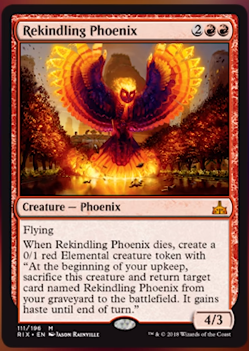 Rekindling Phoenix (up to $12 from about $7): Yes, it looks like an owl. A terrifying one, but yeah, there it is. This seems like a good card in a range of decks, a four-power flyer that requires two removal spells to be dealt with permanently. Notable that you can play it, block with it, and it’ll be back and hasty the following turn. I don’t see a nose/beak of any sort, right? What I can tell you is that the interest in this card is high, but I can’t pinpoint the deck that wants it. Is it another efficient and effective cog in the Temur Energy machine? Is it a new player in Ramunap Red? I don’t know, but exile removal is looking better and better with each day. Something in this set has to be expensive, right? Usually that’s the planeswalkers, but our choices this time around are less-than-bombtastic. It’s been quite a while since we had a set that was so lacking in overall value, something I’ll dive into soon. I think if you open a Phoenix this weekend, move it. We’ve had a lot of variations on Phoenixes over the years, and very few have made huge impacts. It’s true that this one comes back into play and doesn’t need to be recast, but it’s also the most fragile of the group too. It’ll need to see a fair amount of play to hold this price. Dire Fleet Poisoner ($5 now, up from $2): Creatures are incredibly efficient at this point, and this is all sorts of stuff. It’s a sweet combat trick, giving deathtouch on top of +1/+1, but it’s also just a decent aggressive card as a 2/2 deathtouch. This just in: Blocking is for chumps? What I like about this is that the Poisoner gets played as the full set. That always bodes well, but I need more results for this card before I’d invest. My biggest question is the one-drop that gets played the turn before. Right now, there’s some fun Pirates (and a fun payoff in Fiery Cannonade for being all-Pirates) but there’s a lack of aggressive Pirates until now. We are getting a 2/2 for R and a 2/1 attacker for B in this set, and that’s very intriguing. 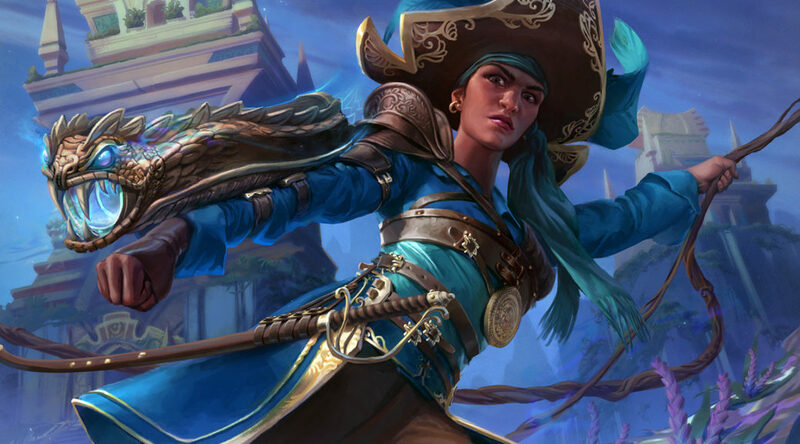 There’s a strong case to be made that if the most-played deck in standard wants to go Attune, Servant, Refiner, the new Pirate deck can shoot under that curve effectively. For right now, though, I’d move this at the new price too. We’ve got a lot of Rivals to open and it would take a whole lot of play to make this a $10 rare. Ravenous Chupacabra (up to $1): It’s no Fatal Push, but it’s got plenty of room to be a $2 or even $3 uncommon. It’s surprising how few creatures in all of Magic have this text without some sort of drawback, like non-black creatures or some such. I love it as a card, and I’d expect it to be a feature of the format until Ixalan block rotates in September 2019. I’m going to tell you to hold any that you open, and trade for them at $1. You won’t be able to sell these for $2 cash, but you’ll be able to trade them away at $2, and send them off to a buylist at $1. If that’s too small-time for you, that’s fine, but this is straightforward. As an aside, if you played Standard during the time of Jace, the Mind Sculptor, you likely remember the ‘Jace test.’ Did your creature do something when it came into play, or did the other person bounce your creature and negate your whole turn? I worry Standard is now getting into the Chupacabra test, but we will see. 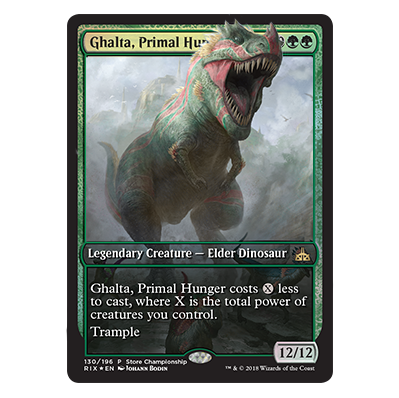 Ghalta, Primal Hunger (currently up to $5 from a low of $2.50): Green never passes the test, unfortunately. Ghalta here started out $10, slid down to $2.50 but has rebounded. A big beater, yes, but this dies to just about everything. Keep in mind that this is going to be the Game Day winner promo, and in case there was casual demand for this dinosaur, that value is about to be soaked up. Move any you open immediately. 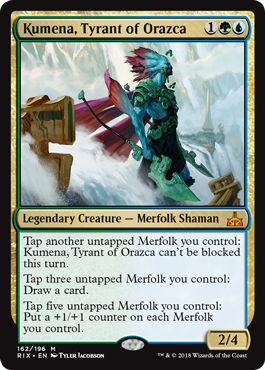 Kumena, Tyrant of Orazca (Started out $10, up to $12.50): This lord does some cool things but the biggest strike against it is the costs you’re paying. Why am I tapping three Merfolk instead of attacking with them all? Do I have that many 1/1 hexproof tokens? It takes a lot of work for this legend to get you ahead on cards, and they don’t do much for the board state. Is the uncommon lord just better? Am I crazy? I have trouble seeing this as an automatic four-of in Standard Merfolk, and that’s the sort of play needed to keep this in the $12-$15 range. Do not buy. Sell if you get them. Cliff is an avid Cuber and Commander player, and has a deep love for weird ways to play this game. His next project will be a light-up sign for attracting Cubers at GPs, so get his attention @wordofcommander on Twitter if you’ve got ideas or designs. So the promo that I am seeing is from an earlier event in December – is there an additional promo for Ghalta with his head coming off of the card like in the picture above? The promo available now is the same art but contained within the frame. Advise! The art with Ghalta coming over the frame is what Wizards has on their Store Championship page. I’m excited for spill too!